ایدینا کیم منزل (اینگیلیسجه: Idina Kim Menzel، دوغوم 30 مئی 1971) ان گؤزل اوْخویان ، رقاصه و تلویزیون اوْیونچوسودور. 2011 The Glee Project Season 1, episode 2: "Theatricality"
2015 Arthur Dr. Paula (voice) Season 18, episode 10: "Shelter from the Storm"
Julie's Greenroom Herself Episode: "The Show Must Go On"
May 30, 2015 October 3, 2015 World Tour 54 This is her first world tour. She held concerts in جنوبی کوره, ژاپون, the هولند, the Philippines, the UK, Ireland, the US, بلژیک, and کانادا. March 29, 2017 September 3, 2017 Idina: 2017 World Tour 57 Performances in the US, بلژیک, هولند, Ireland, کانادا, ژاپون, and the UK. ↑ Turchiano, Danielle (January 27, 2019). ‘Rent’ Star Injured in Live Performance, Original Broadway Cast to Appear. Variety. یوْخلانیلیبJanuary 27, 2019. 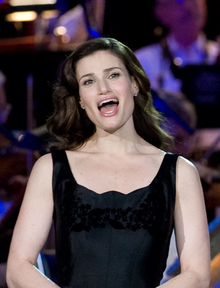 ↑ Idina Menzel 2015 World Tour North American Schedule. ConcertTourNewsHub.com (March 27, 2015). آرشیولنیب اصلی نۆسخه‌دن on April 2, 2015. یوْخلانیلیبMarch 27, 2015. ↑ Idina Menzel World Tour. یوْخلانیلیبMarch 27, 2015.